With the solemn toll of a bell and a moment of silence, the nation paused Thursday to mark the 13th anniversary of the Sept. 11 attacks at the hallowed site just hours after President Obama promised to root out and destroy a new group of terrorists threatening the U.S.
Family and friends read the names of the nearly 3,000 people killed in New York, at the Pentagon and near Shanksville, Pennsylvania. Thelma Stuart, whose husband, Walwyn Wellington Stuart Jr., 28, was a Port Authority Police Department officer, said the nation should pray for its leaders, "that God will grant them wisdom, knowledge and understanding on directing them on moving forward." The twin towers, shown in all their beauty, before 2001. This is how we want to remember the World Trade Center. In an address Wednesday, President Obama said he would open a new military front in the Middle East — authorizing airstrikes inside Syria along with expanded strikes in Iraq as part of "a steady, relentless effort" to root out Islamic State extremists. The shadow of a renewed threat hung over the ceremony, where the sad roll call paused six times: to mark the times when the first plane struck the World Trade Center, when the second plane struck, when the first tower fell and when the second tower fell. Adriana Fiori, reading her father Paul's name, wept. "You put me to bed 13 years ago not knowing it would be your last time," she said. "I miss you so much, Daddy." Joanne Barbara, whose husband of 30 years, Gerard Barbara, was a FDNY captain who died, urged all to feel for not only the lost but "those who continue to suffer from the aftermath. "May God bless America, and may we never, never forget," she said. A new mayor is in office, Bill de Blasio, one far less linked to the attacks and their aftermath than his immediate predecessors. And finally, a nearly completed One World Trade Center has risen 1,776 feet above ground zero and will be filled with office workers. But painful memories linger. Franklin Murray wore a shirt with a photo of his brother, Harry Glen, who worked at Cantor Fitzgerald, one of the companies that lost the most workers. "When I first saw (One World Trade Center), it really made my heart sing," said Debra Burlingame, whose brother Charles Burlingame was piloting the plane before it crashed into the Pentagon. "It does every time I see it because it's so symbolic of what the country went through." The new World Trade Center rises through the fog as the nation pauses to reflect on the lives lost in the 9/11 terror attacks. 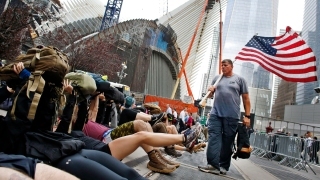 The first ceremony at the site was held six months later and was organized by then-Mayor Bloomberg and his aides. Bloomberg, who took office just three months after the attacks, remained in charge, acting as the master of ceremonies for the next decade. He attended on Thursday, along with Rudy Giuliani who was mayor during the attacks, New Jersey Gov. Chris Christie and Gov. Cuomo. 2) subway to work on 9/12/01 was quietest ride ever. People buried in their newspapers or just their thoughts.